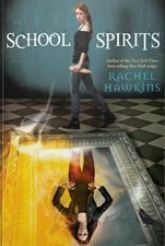 In this Paranormalcy spin off series, Izzy and her mom are in a new town trying to discover why a ghost is haunting a local high school. Izzy’s sister is still missing, and this investigation means that Izzy gets to attend high school for the first time. Fans of Paranormalcy will enjoy this new series because it is full of the same wit and mystery. There are some unexpected twists and turns with a definite cliffhanger leaving room for more books in the series. No quotes that really made me stop and reread.